No human quality is more necessary for survival than love. But while love has the power to lift us up with boundless joy, it has equal strength to crush us—it is easy to lose your way within love’s complex labyrinth of oppositions. 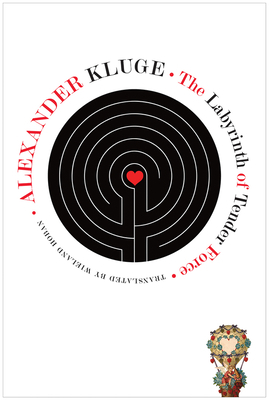 The Labyrinth of Tender Force collects 166 of Alexander Kluge’s love stories previously concealed among his vast library of more than 2,000 texts. “Basic stories” was what he once called them. Organized thematically, these stories take readers on a flight over the maps—the varied topography—of love. This flight ends on a high plateau, at the heart of the most beautiful romances and a cardinal text of modernity about the economy of relationships: Madame de La Fayette’s The Princess of Cleves. The latest offering from one of the greatest living German writers, The Labyrinth of Tender Force masterfully explores the greatest peaks and the most dreadful crevasses of passionate love through an inspired combination of Kluge’s vignettes with drawings, photographs, and other archival material culled from diverse sources.